Note: Where to buy Indian almond leaves. I get a lot of emails asking if I sell leaves and where to buy Indian Almond leaves. I do not sell leaves at this point. The best place to buy leaves in my experince is Ebay. I recommend the provider Amy-lim that I got good experiences with. Indian almond leaves (IAL) have traditionally been used by Betta (Siamese Fighting Fish) breeders in South East Asia to mimic the natural Betta habitat. They are believed to aid the fish in a number of ways, such as helping fighting fish heal after a battle and inducing spawning in breeding tanks. Unfortunately, the affect of Indian almond leaves on aquarium fish has not been scientifically studied yet so it is difficult to separate the truth from the myth. I can only speak from personal experience and my own good track record using Indian almond leaves, and base my conclusions on reports gathered from other fish keepers. Why do aquarists use Indian almond leaves? Indian almond leaves are often described as ”the poor man’s water conditioner” due to their capacity of altering the water chemistry in an aquarium. In the wild, fish evolve to fit into their particular habitat and having to live in another type of environment in captivity is often difficult for them. Even if your fish manages to survive in less than ideal conditions, there is a great difference between thriving and merely staying alive. 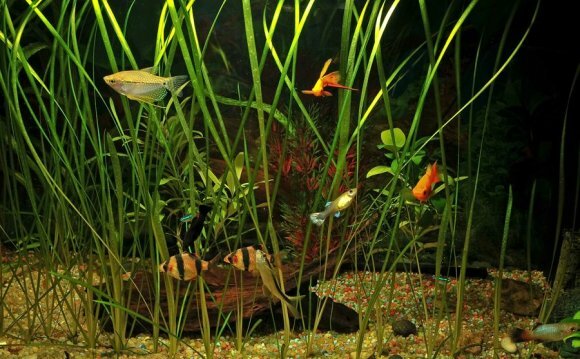 If your fish hails from a habitat where leaves and other plant debris regularly falls into the water and decompose, your fish will be used to that kind of environment and trying to mimic it in the aquariums is strongly recommended. Leaves that fall into the water release a myriad of different compounds, from trace minerals to dyes, and animals living in the water adapt to having all these different compounds readily available. When we place fish in our “clean” and rather unnatural aquariums, we in avertedly deprive them of access to a long row of different compounds present in their native habitat. If your fish hails from the type of environment described above, Indian almond leaves are one way of making life in captivity a little more natural for your pet. Just like driftwood and peat, Indian almond leaves release ample amounts of tannins into the water. The tannins affect the pH-value (how much will depend on the buffer capacity of your water) and you will also see how the water turns dark – just like a blackwater river. Needless to say, water rich in tannins is appreciated by fish species that hail from such environments in the wild. So called blackwater habitats are formed when rivers flow slowly through heavily forested areas where falling leaves and other plant debris end up decomposing in the water. You can find more detailed information about the chemistry of Indian almond leaves in on the Indian almond leaves chemistry page. That page also includes a section on blackwater habitats. N.B! Using almond leaves will give the water in your aquarium a yellow to reddish tea-coloured shade. Exactly how dark the water gets depends on the concentration of tannins in the water. Some aquarists dislike this tint which they find unsightly, but try to keep in mind that for fish hailing from blackwater habitats this dark water is actually the normal state of things and the crispy “clean” 100% transparent water without any hint of colour favoured by many aquarists is quite unnatural for them. Is it true that Indian almond leaves prevent and cure diseases in aquariums? Indian almond leaves are rich in compounds produces by the tree to protect itself against bacteria, fungi and similar organisms. Because of this, it has been speculated that adding Indian almond leaves to an aquarium will decrease the risk of disease in the tank or even help fish. As far as I know, no one has yet carried out any scientific study to verify this claim. Compounds found in Indian almond leaves have however been researched for their potential health benefits for the human body. Quercetin, a type of flavonoid found in Indian almond leaves, is for instance considered anti-inflammatory and has antioxidant properties, while several other flavonoids present in these leaves – such as kaempferol – decrease the risk of developing certain types of cancer.